Seventh Street Books, 9781633880047, 303pp. Mary Higgins Clark Award Winner! OLD RIVALRIES NEVER DIE. BUT SOME RIVALS DO. Juliet Townsend is used to losing. Back in high school, she lost every track team race to her best friend, Madeleine Bell. Ten years later, she’s still running behind, stuck in a dead-end job cleaning rooms at the Mid-Night Inn, a one-star motel that attracts only the cheap or the desperate. But what life won’t provide, Juliet takes. Then one night, Maddy checks in. Well-dressed, flashing a huge diamond ring, and as beautiful as ever, Maddy has it all. By the next morning, though, Juliet is no longer jealous of Maddy—she’s the chief suspect in her murder. To protect herself, Juliet investigates the circumstances of her friend’s death. But what she learns about Maddy’s life might cost Juliet everything she didn’t realize she had. 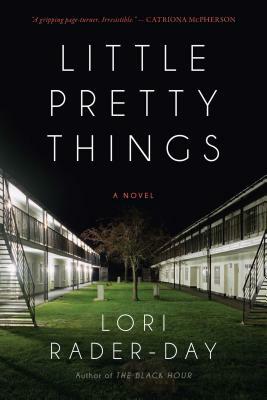 Lori Rader-Day, author of The Black Hour and Little Pretty Things, is a two-time Mary Higgins Clark Award nominee and the recipient of the 2014 Anthony Award for Best First Novel. Lori’s short fiction has appeared in Ellery Queen Mystery Magazine, Time Out Chicago, Good Housekeeping, and others. She lives in Chicago, where she teaches mystery writing at StoryStudio Chicago and serves as the president of the Mystery Writers of America Midwest Chapter. Her third novel will be released by Harper Collins William Morrow in spring 2017. "Pack this one in your beach bag and get your book clubs ready - I think we’ve found this year’s hottest summer title!" WINNER! ANTHONY AWARD: BEST FIRST NOVEL! 2015 MARY HIGGINS CLARK AWARD NOMINEE! LEFT COAST CRIME ROSEBUD AWARD - BEST DEBUT MYSTERY NOMINEE! 2015 BARRY AWARD – BEST PAPERBACK ORIGINAL NOMINEE! "An exceptional debut.... An irresistible combination of menace, betrayal, and self-discovery." "Captivates from page one.... This reviewer was bowled over by the novel's alternating points of view, superb storytelling, and pitch-perfect take on academia." "This first novel about two broken people is a psychological thriller like the best of Alfred Hitchcock. . . . Riveting and full of surprising discoveries. Highly recommended." "Addictive.... A perfect thriller for the summer." "An unusual protagonist, a timely crime, and outstanding writing make Lori-Rader-Day's The Black Hour a stand-out debut."